Homestyle beef fritter covered in homemade sausage gravy, two farm fresh eggs, choice of potato, and toast. Two farm fresh eggs, choice of breakfast meat, choice of potato, and toast. Homemade grilled corned beef hash with peppers and onions, two farm fresh eggs, and toast. Two farm fresh eggs, grilled ham, and an English muffin covered in our Hollandaise sauce, with choice of potato. Apple-wood smoked bacon, sausage, our seasoned griddled potatoes, scrambled eggs, onion, cheese and salsa stuffed in a flour tortilla. Our jumbo homemade buttermilk biscuit smothered in our famous sausage gravy with two farm fresh eggs and choice of potato. Choice of potato topped with two sausage patties, two farm fresh eggs, melted cheese, and grilled peppers and onions, served with toast. Farm fresh fried egg with your choice of meat topped with melted cheese on an English muffin. House-battered chicken strips over a jumbo buttermilk biscuit covered with our homemade sausage gravy. Two farm fresh eggs and griddled homemade meatloaf served on a toasted English muffin with our spicy sriracha hollandaise. Corn chips piled high with seasoned taco beef or chicken, tomatoes, green peppers, olives, onions, jalapeños, and melted cheese, served with sour cream and salsa. Large stuffed tater tots served with seasoned sour cream. Diced ham, green peppers, onions, tomatoes, and cheese. Onions, green peppers, tomatoes, mushrooms, and cheese. Cheese omelet covered in our award-winning House Chili. Two farm fresh eggs, two pieced of French toast and choice of breakfast meat. Two slices of French toast with a cream cheese filling, topped with strawberry glaze. Just like "The King" enjoyed it. Stuffed with peanut butter and bananas with a side of jelly and syrup. Two house buttermilk pancakes with blueberries. Available daily. Ask your server for today's selection. Crispy chicken strips tossed in buffalo sauce over mixed greens, avocado, bleu cheese crumbles, red onion, tomatoes and buttermilk ranch with a warm garlic bread stick. Fried flour tortilla loaded with iceberg lettuce, seasoned ground beef, shredded cheese, black olives, green pepper, red onions, tomatoes with salsa and sour cream on the side. Chopped mixed greens topped with ham, grilled chicken and bacon bits, with shredded cheese, hard boiled egg, tomatoes, bell peppers, onion and choice of dressing, Served with a garlic bread stick. 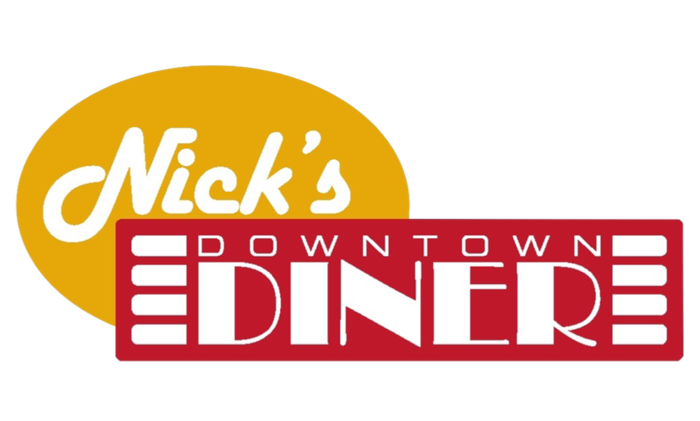 All of Nick's Diner Sandwiches are served with a Kosher dill pickle spear, and French fries or kettle chips. Locally sourced Ferndale turkey, and apple-wood smoked bacon piled high on Texas toast or grilled wheat toast, with lettuce, tomato and mayo. Braised short rib topped with caramelized onion, American cheese, pepper jack cheese, and served with a side of Au Jus. Seasoned corned beef topped with sauerkraut, Swiss cheese and 1000 island dressing on grilled rye. Slow roasted pulled pork topped with BBQ sauce and homemade coleslaw on our House bun. Thick cut apple-wood smoked bacon with lettuce, tomato, avocado, and mayo, on grilled white or wheat toast. Seasoned grilled chicken, apple-wood smoked bacon, lettuce, tomato and shredded cheese in grilled floured tortillas with buttermilk ranch. Fresh made tuna patty, with lettuce, tomato, and melted American cheese on Texas toast or grilled wheat toast. Your choice of American, Swiss, Pepper Jack, Bleu Cheese Crumbles or Cheddar cheese. Apple-wood smoked bacon and choice of American, Swiss, Pepper Jack, Bleu Cheese Crumbles or Cheddar cheese. SPICY! Cajun seasoned burger with jalapeños, fried onion, Pepperjack cheese, and a side of Chipotle mayo. Cajun seasoned burger, bleu cheese dressing, fried onion, and tomato. Topped with apple-wood smoked bacon, BBQ sauce, Cheddar cheese and an onion ring. Served with sauteed mushrooms and Swiss cheese, topped with a tomato slice. A local favorite! Served open faced and topped with Nick's famous house chili, onions, and shredded Cheddar cheese. Served with lettuce, tomato, avocado, sprouts, onion and a choice of cheese. Fried onion and American cheese on grilled marble rye. Our secret old-fashioned recipe, cut thick and served open faced with mashed potatoes and gravy. Slow roasted beef piled high between Texas toast topped with homemade mashed potatoes and gravy. Locally sourced Ferndale turkey roast between Texas toast and topped with mashed potatoes and gravy. Upgrade your Sandwich or Burger SIde for only a dollar! Barbara's famous made-from-scratch pies. Ask your server for today's selection. Fresh brewed with a lemon. Freshly ground regular or decaf, unlimited.